HPD Chief Art Acevedo and the families of the injured officers spoke on Christmas Eve, just hours after they were involved in a fiery crash. 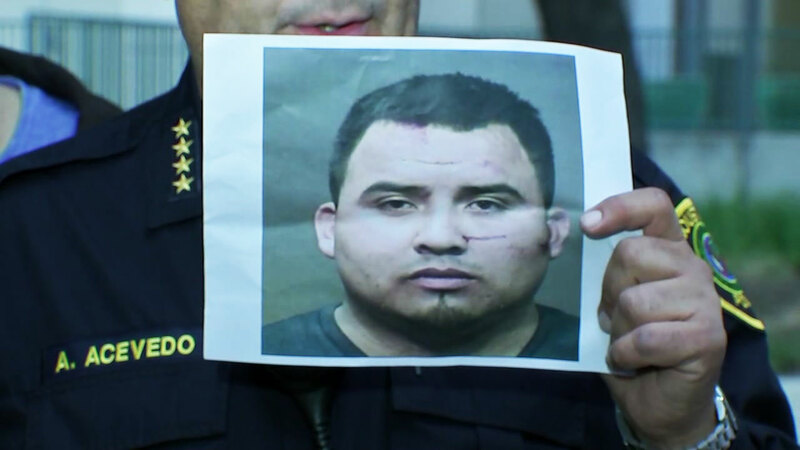 HOUSTON, Texas (KTRK) -- A suspected drunk driver has been charged after police say he caused a fiery crash involving two HPD officers. Cesar Collazo, 23, is facing two counts of assaulting a peace officer and two counts of failing to stop and render aid involving severe bodily injury. Houston Police Chief Art Acevedo said the crash happened just after midnight at the 10100 block of Telephone Road. HPD said the officers were responding to a call when a vehicle overturned in front of their cruiser, nearly causing a head-on collision. The officers' patrol vehicle flipped multiple times before it erupted in flames. Surveillance video from across the street of the incident captured moments the patrol car crashed. New surveillance video shows the moments a Houston police patrol car crashed on Telephone Rd. An Eyewitness News viewer also sent in a dramatic video showing the patrol vehicle engulfed in flames after the crash. A resident shot video of police car burning, after accident with suspect DWI driver. Chief Avecedo said the passenger officer, Alonzo Reid, was able to exit the vehicle to search for help. When Officer Reid found a passerby, they were able to get back to the scene where the vehicle had crashed. Reid and the witness were able to rescue the driver, Officer John Daily. Chief Art Acevedo updates on the officers injured during a crash involving suspected drunk driver. Officer Daily was transported to the hospital by Life Flight, while officer Reid was transported by ambulance. Acevedo says Officer Daily sustained serious burns to 50 percent of his body. Both officers are expected to make a full recovery. The suspect in the crash did not have a prior record, police said.